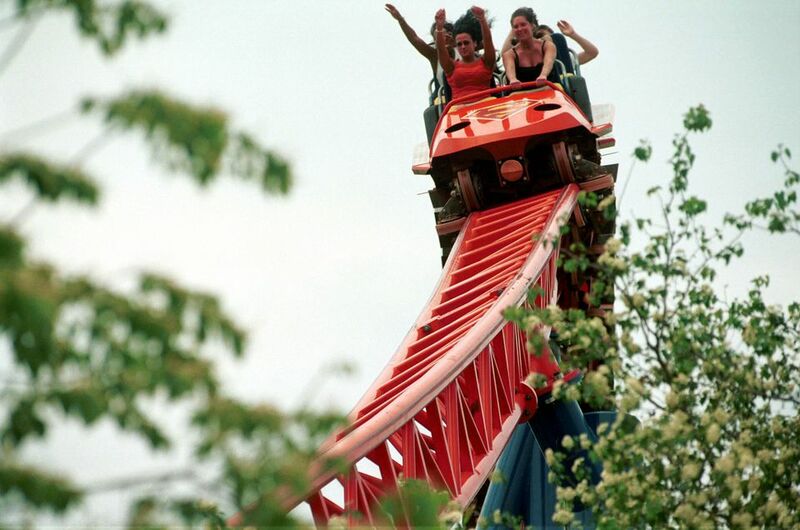 Note: In 2009, Six Flags New England re-themed and renamed its popular Superman: Ride of Steel coaster as Bizarro. In 2016, it reverted back to its original theme and tweaked the name. It is now known as Superman the Ride. It's not the tallest coaster. It's not the fastest either. But, Superman the Ride at Six Flags New England is the world's best steel coaster. Here's why. Superman the Ride sits in the back of the park, along the banks of the Connecticut River. Its imposing red hill soars to incredible heights and dominates the Six Flags New England skyline. Like a flame that lures moths, the coaster beckons riders even as it threatens to send their adrenaline into overdrive and scare the kryptonite out of them. This ride of steel demands nerves of steel. From the start, everything about Superman the Ride is coaster perfection. The cars have raised seats and low-slung sides. Instead of an over-the-shoulder harness (there are no inversions), an unobtrusive seat belt and a u-shaped safety bar add to the car's open and exposed feeling. The coaster uses a traditional lift hill. The train click-clack-clicks up, up, up, and a-way up. If you are able to get your mind off of the ensuing madness, the views of the river are lovely. Onboard speakers blast music. While the music plays throughout the ride, it can really only be heard while ascending the lift hill. It's a nice touch, but the music doesn't do much to help tell a story or make the coaster any better. The high-speed first drop is pure coaster nirvana. With a 70-degree angle of decent, the train accelerates to nearly 80 mph. It hugs the track and yields a surprisingly smooth ride throughout, even at faster-than-a-speeding-bullet speed. How can a coaster rise 208 feet and drop 221 feet? At the bottom of the first hill, the train enters an underground, fog-enshrouded tunnel. Incredibly disorienting, it is among the ride's best features. As the train leaves the tunnel to ascend the second hill, Superman the Ride delivers its first dose of delirious airtime. The coaster is an airtime-lover's dream. Even after the train turns around and heads back towards the station, Superman the Ride never lets up. It's one of those rare coasters that positively screams until it hits the magnetic brakes at its conclusion. A series of camelback hills keep the major airtime coming. The track then snakes in and around the park's DC Superheroes area before it dives into a second fog-filled tunnel. A couple of smaller bunny hills offer yet more airtime. A final banked helix sends Superman's riders flying into the station. The returning passengers invariably look elated and sport frozen grins born from equal parts of terror and joy. And that, my thrill-seeking friends, is the very essence of a great roller coaster experience. There are coasters with similar layouts and built by the same manufacturer at Darien Lake (Ride of Steel) in New York and Six Flags America (Superman: Ride of Steel) in Maryland. While they are wonderful rides, everything about the New England version—the tunnels, the way the track integrates with the surrounding park, the airtime, the smooth ride, the relentless speed—is better. It's just an incredible coaster achievement. Superman the Ride tops the list for best steel coasters. As the park's signature ride, lines for Superman can get especially long. If you are visiting on a busy day, you might want to consider springing for Flash Pass, Six Flags' skip-the-lines program. Can a ride aboard a roller coaster qualify as a life-altering experience? Well, that may be stretching the truth. But, in Superman the Ride's case, not too far.